Closed loop systems encompass chilled water, hot water and dual temperature systems. 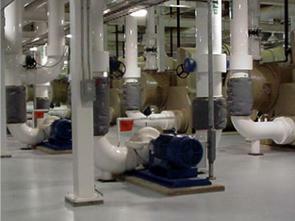 Typically, there are multiple closed loop cooling systems in a power plant for example. Closed loop systems can also be most commonly found on the intakes of combustion turbines. These systems most likely will control the temperature on vital components and system parts. The most important objective in closed loop systems is to minimize corrosion of the system metals while maintaining clean system water. This will ensure maximum equipment service life of the treated systems while reducing costly mechanical breakdowns. It is difficult and requires careful attention to detail to maintain these closed loop systems. Once corrosion occurs in a system, it can never repair itself. The only to repair the corroded section is to replace it which will increase overhead and operating costs. Synergy products offer the most advanced treatment chemistries to protect systems encompassing mild steel, copper, brass, aluminum and stainless steel, for example. Improper treatment will almost always lead to system corrosion. It is much better and more cost effective to practice corrosion prevention within a closed loop system than it is to try and fix a corroded or contaminated system. Our treatment chemistries combined with our closed loop filtration systems guarantee a successful treatment program to help minimize corrosion and keep your systems and vital parts running smoothly and efficiently.